This weekend I am preaching revival services at our church in Madison Indiana. Madison is an Ohio River town. It is a charming river city. Irene Dunne a movie star though born in Louisville KY., lived in Madison from age 12 until she graduated from high school. There is a sign on main street that documents her many achievements. Today I have walked all over the historic and charming downtown. Downton sits just a block or so from the river. Today is unseasonably cold and there have been snow flakes even on this the 9th of April! I have made some news friends. I had lunch with Dennis Bickers yesterday, I have read all of his books on subjects ranging from healthy small churches, to bi-vocational pastors. While eating lunch with him he was greeted by the mayor and other friends. Such is the way of life in a small town. Today I met some more friends for lunch. I was able to wander the streets and visit the local businesses. I went into a unique bookstore and the young man working there offered me a free cup of coffee. He gave me a tour of this “used” bookstore and told me about the owners and the town. He invited me to have a seat and we visited for about 20 minutes. I continued my journey and ducked into a bakery and ordered another cup of coffee. I sat with my kindle and coffee. Again, I was immediately engaged in conversation by my new friend Tom. I do not know Tom, he told me his name, and that he lived here all of his life except while serving in the military. He was sitting at a small table in the bakery, which he had transformed into a make shift fresh honey stand. He is a bee-keeper as well as several other things. It was too cold for the city market and his friends at the bakery let him set up his make shift honey stand in their business. Did I mention I was in a small town. In fifteen minutes I knew his opinion regarding politics, religion, Jefferson county Indiana the town of Madison all the way up to the President of the United States. I now know where he lives in the country and who all of his neighbors are. I know what high school he graduated from and that he loves to garden. Did I mention I am in a small town? When I realized I was not going to get any reading done, I closed my Kindle and just visited with my new friend Tom. I must confess I have enjoyed my day. No one talked to me because I was a district superintendent. No one I spoke with today even knows what the words “district superintendent” mean! They just like to talk to people. 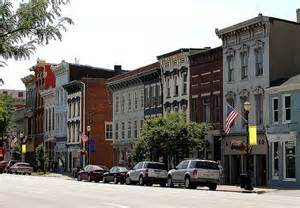 I am not sure how nice of a place Madison Indiana is to live, but today I can tell you it is a nice place to visit. 1 Some places make you feel welcome. Really the places don’t make you feel welcome, the people do! 2 People matter. Today I felt like I mattered. Tom felt like he could tell me his life story in 20 minutes. I know he tells everyone his life story, but I actually enjoyed hearing his story. I am not by disposition a listener, I am a talker! I have been working on my listening skills and God sent me plenty of people today to listen to, and I confess I enjoyed listening to their stories! We all need to be better listeners. 3 It does not take much effort to get people to talk, if you ask a question or just listen to what they are saying. 4 If you want to have friends, try being a friend, a listening ear. 4 Getting out of town periodically is a tonic. Madison has reminded me that reality is not always as it seems. Sometimes a change of scenery is a good thing. Things look differently when you change your perspective. Maybe the best thing you could do today is to take a nap or get out of your town and see that God is still in control. In other words go talk to Tom and maybe even buy a jar of his honey! Dr. Blake: It was so nice to read your blog and I’m glad you like our City of Madison. Just from your description i believe I know the interesting “Tom” you visited with earlier today. Madison and Jefferson County has so many interesting and friendly people who live and work here and many who come for a visit and decide to retire here. Wishing you a successful revival at the Church you are preaching too this evening. Don’t be a stranger and come back another time when not in an official capacity and visit with more people and see many interesting places. Madison has a great mix of down-home folks and Professionals. We have global companies and regional company headquartered here. Madison is also home to a wide range of successful small businesses and entrepreneurs. We enjoy the quiet River, visiting with our neighbor’s, and volunteering. We take pride in our downtown. (Did Tom tell you that almost the entire downtown area is on the National Historic Register?) We’re not stuck in time here and most of us do know what a district superintendent is. We’re all just folks here. Madison has a great mix of people who have lived here all their lives, people who grew up here and moved back and people like me who came just for a visit and found a way to stay. We’re building walking trails, growing our Arts community, and we love music. Jefferson County is home to Hanover College. Madison is home to Ivy Tech Community Community College and Clifty Falls State Park. I could go on and on. But – Please do come back and continuing discovering all these things for yourself. Be sure to visit our Farmers Market at the Broadway Fountain where you can enjoy a great breakfast with more folks on Saturday mornings.